Discover fantastic cycling, open roads, dramatic landscapes and epic climbs in cycling’s best kept secret. Flyingeese provides outstanding cycling holidays for those with a sense of adventure and a love for the sport. 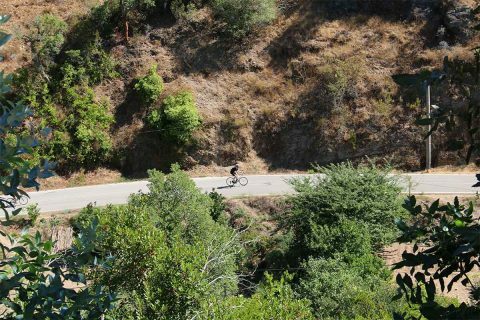 We host small groups, supported by former GB international cyclists over six days in Portugal’s Monchique Mountains. Riders are supported by personal nutrition plans, performance coaches, and support vehicles. Out of the saddle, riders unwind in beautiful private villas. The quality of the support and facilities that you’ll find on a Flyingeese trip will bring new dimensions to your riding. Packages for cycling holidays range from £750-£850 per person based on two sharing. I would definitely recommend Flyingeese to anyone who wants to ride in a different country. The roads are perfect for cycling, there is not a car in sight, so its really different to cycling in the UK. Get it booked - it was absolutely brilliant!